There is no overnight success. Not in business, and definitely not in crowdfunding. It only appears so. And to prove it, I decided to research one of crowdfunding’s darlings, the Pebble Watch. A triple crown of a crowdfunding success story, Pebble’s first campaign raised over $10M on Kickstarter in 2012. That first Pebble campaign put rewards crowdfunding on the map as a funding game-changer for start-ups who had previously been kept in the gate when VCs didn’t see their potential. That’s actually where Pebble’s crowdfunding story began. Turned down for additional funding by the VCs they pitched, founder Eric Migicovsky and his team asked the crowd if they wanted the new Pebble wearable technology. The crowd gave a resounding “Yes.” A crowdfunding Cinderella story, right? You are not the Pebble Watch. The Pebble Watch is a crowdfunding unicorn. But even unicorns have something to teach us regular horses. 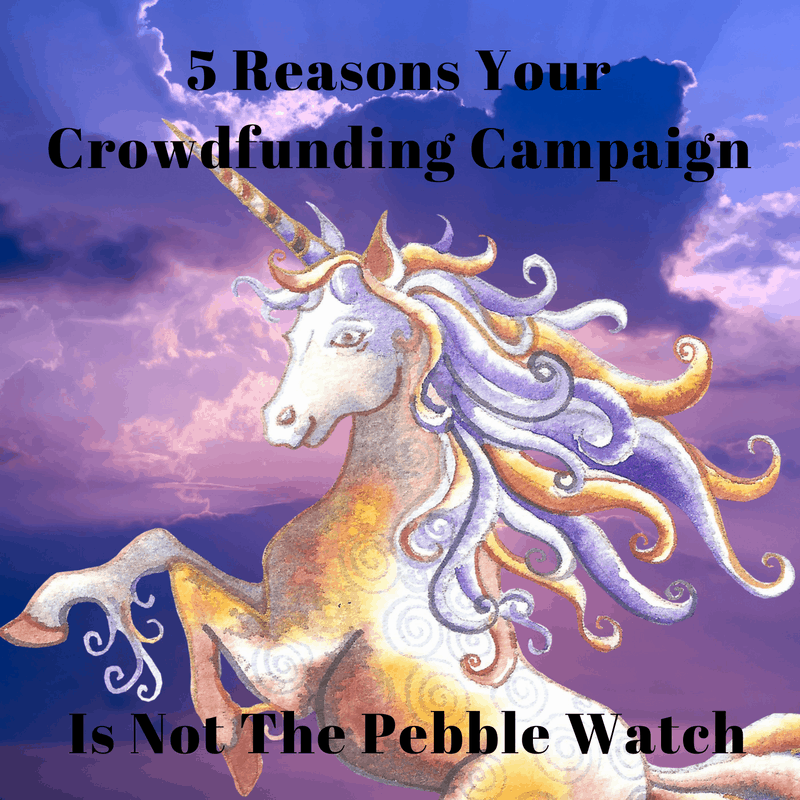 Pebble didn’t come by their first success in 2012 simply by waving a crowdfunding magic wand. Years of product and audience development, and months of crowdfunding preparation preceded their initial and continued success. So let’s get to it. 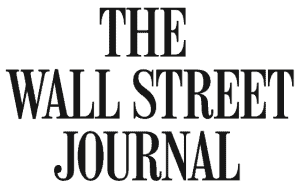 Industry: Is your campaign for a first-of-its-kind technology attractive to early adopters and app developers? 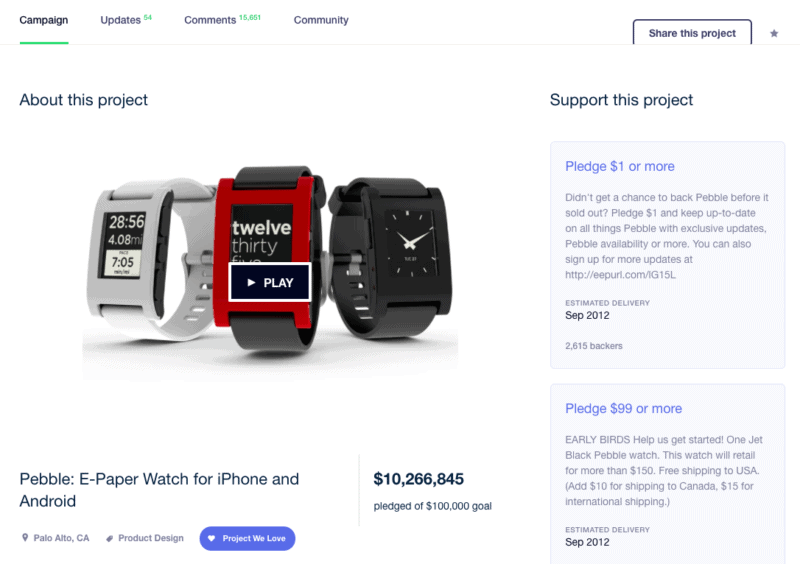 Over 25,000 of Pebble’s 68,929 backers had already backed a campaign on Kickstarter. Not every industry gets the same love from the crowdfunding community. The more innovative or controversial the more likely your campaign will get attention. In fact, only certain industries like design, technology and gaming have active crowdfunding backer communities. But don’t just sit back and expect the platform to lead them to your campaign. Won’t happen. Crowdfunding platforms only showcase campaigns that are already successful, if they showcase them at all. Track Record & Audience: Are you an established company with a proven track record bringing over 1,500 actively engaged prior customers to your campaign? Pebble blew out their $100,000 crowdfunding goal in 2 hours. This doesn’t happen if you haven’t put in A LOT of practice laps around the track, especially building your email list. 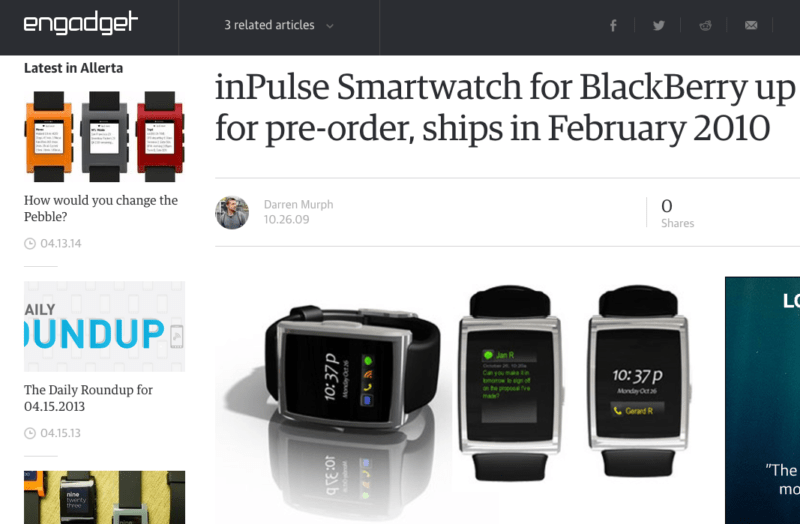 inPulse, the company that developed the Pebble Watch, had already released the successful inPulse for Blackberry in 2011, and then continued an active conversation with its customers to develop the Pebble technology. Their existing customers (and one can only assume their much larger email list of iPhone and Android users) were invested and eager, and showed up quickly to buy. 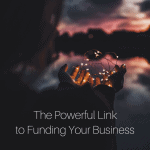 Initial Funding: Do you have initial funding and advisory support from a respected startup incubator like Y Combinator? And 6 months of funding left to launch your campaign? Pebble did. Prize-winning horses are the product of good training and care. The Pebble team spent 45 of those days putting their campaign together. And I’m sure they spent at least the equivalent of 5% of their stated goal in their team’s time to market the campaign. According to Crowdfundx founder, Darren Marble, that’s the industry average for marketing costs for successful campaigns. Influencer Outreach: Did you research every blogger in the gadget space to see how often they posted about Kickstarter projects and reach out to a vetted list of 60-70 bloggers upon launch? Pebble did. Not that bloggers posting about Kickstarter is the right criteria for your project, but the point is that they had done their research. They knew the bloggers writing about their industry and how to pitch to their specific interests. PR: Did you spend 2+ months working with Engadget on your PR exclusive? This was not a new PR relationship for the Pebble team. Engadget had been featuring stories on inPulse since 2009, along with other publications ranging from Wired to Fast Company. They didn’t start building their media relationships with their first campaign. They had four years in the wearable technology space to lean on. Do your research. Reverse engineer campaigns like yours. What kind of messaging did successful campaigns use to connect with their backers? What approach did they take with their video? What is a reasonable funding goal for a company in your stage of development in your industry? Even the Pebble Watch with their active customer base of 1,500 and guaranteed PR was realistic about their goal of $100,000 that required about 850 backers to back the campaign at the average watch price of $115. Find people who care. People back crowdfunding campaigns because they care about what people are creating. Don’t go buying random Twitter followers and email lists. You will get zero conversion. Instead, identify the people who care about topics or products like yours and find out where they hang out online. Use social tools strategically to reach out to that target audience, and if needed, invest in marketing professionals to amplify your efforts. 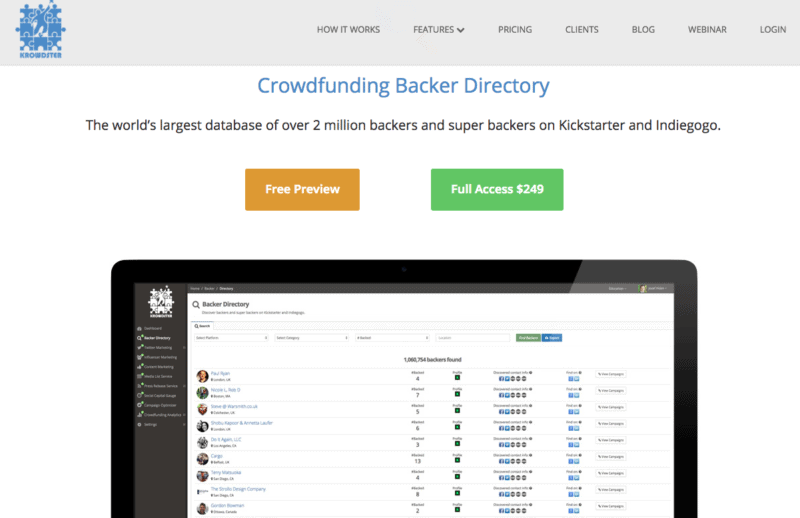 Use Krowdster’s Backer Directory to find people who care about crowdfunding projects like yours. Then encourage those who engage to visit your website and give you their email by offering something that benefits them or running a contest. Does it take a bit of effort? Sure. But even thoroughbreds have to train for their prize-winning races. Give your marketing channels time to grow. Technology has accelerated the speed of communications and our ability to reach a wider audience, but relationships and trust are built through consistency of communication over time. Engage with your new network. Ask questions and seek feedback. Become a familiar name in their social feed or their inbox before you even mention your campaign. For Pebble, that time horizon was four years. Maybe you could give it at least four months? 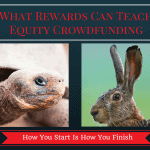 Crowdfunding is about more than funding. Focus on acquiring a crowd that can help your business grow over time, not just be a one trick pony. Learn from Pebble and earn your own crowdfunding crown.